It is designed to be an independent datalogger, or a reliable component in a larger data acquisition system. Arriving field-ready from the factory with power, communications, and an enclosure, the CRVW3 is built for your monitoring needs. The CRVW3 uses vibrating-wire spectral-analysis technology (VSPECTTM) to provide the best measurement possible for vibrating-wire sensors. VSPECTTM observes the incoming sensor signal, performs a Fourier transform and a spectral analysis, and determines the sensors' frequency by identifying the strongest signal in the acceptable range, disregarding external noise. The CRVW3 provides the following data: the resonant sensor frequency, thermistor resistance for temperature calculation, and diagnostic values to help determine the validity of the frequency measurement. The CRVW3 Vibrating-Wire Datalogger is capable of measuring the most common vibrating-wire sensors including, but not limited to, strain gages, piezometers, pressure transducers, tiltmeters, crackmeters, and load cells. 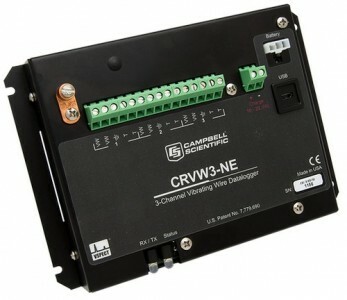 The CRVW3 has three sensor inputs; each sensor input includes a vibrating-wire sensor connection and a thermistor connection. 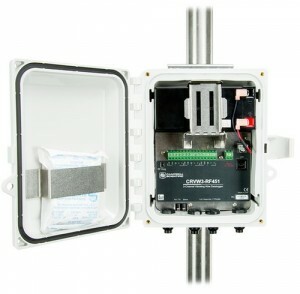 The channels are easily configured for traditional sensors. Individual channels can be adjusted to read only the vibrating-wire sensor, or they may be turned off completely.